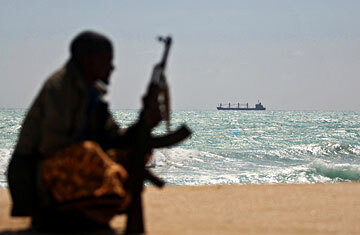 This time last year, Somali pirates dominated headlines in the U.S. The hijacking of the Maersk Alabama, a tanker captained by an American, led to a made-for-Hollywood intervention by sharp-shooting Navy SEALS and triggered a media frenzy about the rise of piracy off the Horn of Africa. In the months that followed, a U.S.- and E.U.-led naval task force stepped up patrols around Somalia's coastline and lessened the threat posed by pirates there. This year there were only 17 attacks in the Gulf of Aden and the waters surrounding Somalia between January and March  a peak time for piracy in the region because of favorable weather conditions  compared with more than 40 in that same period in 2009. But Somalia's pirates are far from defeated. On April 18, they pulled off one of their most ambitious captures yet, seizing three Thai fishing trawlers far out into the Indian Ocean. The vessels, which contained 77 crew members, were 1,200 miles away from the Somali coast  making the hijacking the farthest offshore heist ever conducted by Somali pirates as well as the largest in terms of numbers of hostages taken. Three days later, just four suspected Somali pirates armed with AK-47s and a rocket-propelled grenade managed to seize a Panamanian-listed bulk carrier 200 miles out from the Gulf of Aden corridor, which is still patrolled by convoys of international warships. Despite the vigil of many of the world's powerful navies, it's clear that the pirates' reach seems to be widening, with the majority of recent successful attacks taking place closer to the Indian Ocean archipelagoes of the Maldives and the Seychelles than Somalia. Currently, 15 vessels and 326 sailors are being held by Somali pirates  similar numbers to this time last year. Noel Choong, head of the International Maritime Bureau's Piracy Reporting Center, based in Kuala Lumpur, says his organization has been receiving frantic calls from shipowners asking which Indian Ocean routes are safe. "It's difficult to know what to tell them," he says. "The pirates have been popping up almost everywhere." Analysts say the increasing range of the pirates is a tactical response to the foreign crackdown over stretches of sea closer to Somalia. Pirate captains "have learned the lessons of being hemmed in by these international navies," says Roger Middleton, an expert on the Horn of Africa at Chatham House, a London-based think tank. "They're probably thinking, The further away we go, the more scattered we are, the harder it is for the foreign navies to catch us." At the peak of the patrols, there are between 35 and 40 warships plying the waters off Somalia and safeguarding commercial vessels transiting through the Gulf of Aden. Given that Somalia's 1,900-mile coastline is continental Africa's longest, there are plenty of holes for pirate "motherships"  retrofitted fishing vessels that tow along smaller skiffs and often carry large reserves of fuel as well as GPS equipment  to putter into the deep sea of the Indian Ocean. Middleton estimates that it would take a mammoth flotilla of 700 or 800 ships in the region to actually neutralize the full, albeit rudimentary, capabilities of the pirates. That sort of mobilization is unthinkable, not least because modern navies simply do not boast such numbers. The current international anti-piracy effort comprises separate American, NATO and E.U. task forces as well as independent detachments of warships sent by countries like India, China and Russia. Operations have been loosely coordinated from U.S. Navy regional headquarters in Bahrain at monthly meetings of the Shared Awareness and Deconfliction group, coined "SHADE." So far, this conclave has enabled better policing of the Gulf of Aden, a vital artery for commercial shipping, and the protection of vulnerable vessels like the World Food Program ships that bring aid to Mogadishu, Somalia's beleaguered capital. But the now vital work of monitoring vast stretches of the Indian Ocean will require far more coordination, particularly in the sensitive military field of surveillance. Sam Bateman, a maritime-security expert at the S. Rajaratnam School of International Studies in Singapore, questions whether that sort of cooperation can be achieved. "Aerial and eventually satellite surveillance is going to be essential to countering the piracy threat," he says. "But you can imagine the U.S. would be rather unwilling to reveal to, say, China the full extent of its capabilities." The anti-piracy task forces are already dealing with a host of other legal and logistical headaches, from tight rules of engagement  innocent Somali fishermen have been mistaken for combatants  to the dilemma of what to do with pirates who are arrested in international waters. Eleven suspected Somali pirates appeared in a Virginia court on April 23 in connection with attacks that occurred earlier in the year, but U.S. and European officials fear that trials like that one may open up a jurisdictional can of worms as well as lead to many applications for asylum. Some policymakers have even suggested instituting a roving, U.N.-backed floating criminal court. And then there remains the source of the crisis: Somalia itself. "Right now, we're trying to shoot the arrow instead of the archer," said Admiral Mark Fitzgerald, commander of U.S. naval forces in Europe and Africa, to reporters on April 16. Coping with a reviving Islamist insurgency, Somalia's fragile transitional government has little ability to thwart the pirates, who in some instances have become capable power brokers in the nearly lawless country. A U.N. report presented to the Security Council in March pointed to the growth of a largely corrupt war economy in Somalia, fueled by illicit gun running and bribery of government officials. "Even with the best of intentions, piracy is not going to be at the top of any Somali politicians' priorities," says Middleton of Chatham House. In the absence of any political solution on land, shipowners and sailors have been encouraged to keep constant watch, maneuver away from suspicious vessels and adopt strategic measures in case of attack, such as retreating to a citadel at the heart of the ship, to keep the crew away from the pirates' clutches. At the Pentagon last week, Fitzgerald said he thought it was a good idea for shipowners to arm their crews or enlist private security firms to stand guard, something most vessels have elected not to do. It's a scenario that raises great apprehension among those in the maritime community. "The pirates we've seen from Somalia have been generally nonviolent  they don't try to shoot the crew," says the International Maritime Bureau's Choong. "If people have guns and start firing, who knows what will happen. Violence begets violence." The original version of this story stated that it was Marines who intervened in the Maersk Alabama incident, not Navy SEALS.